Besides the amazing Lionhead rabbit breed there are also many other dwarf breeds of domestic rabbits that are worth mentioning. Below an overview is shown of some of the most popular dwarf rabbit breeds. The dwarf rabbits include some of the smallest domestic rabbits. Most of them have a small and compact body along with a short neck. In general they need more attention than regular rabbits. We can recommend to visit RabbitPedia.com in order to learn more about all the other domestic rabbit breeds as well great information about rabbit care. Make sure to check it out! 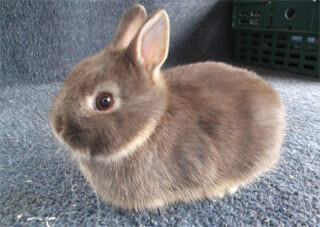 The Netherland dwarf is by far the most popular dwarf rabbit breed. When people talk about dwarf breeds in general in most occasions they will think about the Netherland dwarf. Despite the fact that they are very small these rabbits are incredibly active. Due to their tiny size they are often seen as adorable pets. They are able to be trained by their owner, however success isn’t guaranteed. They have a reputation to be skittish which means that they might run away from people that are trying to touch them or they might seek cover in remote corners of their hutch. With the appropriate training and handling it is possible to learn them to make contact with humans and interact. Therefore the Netherland dwarfs serve as ideal rabbit pets for children as well as adults. If you are interested in the larger rabbits you should consider the flemish giant rabit, this is one of the largest rabbit breeds out there. They are also called friendly giants because of their size and friendly personality. Excellent choice for kids. The Dwarf Hotot is one the newer dwarf breeds in the United States. It is a small rabbit that can recognized by it’s completely white coat, except a tiny circle around its eyes. Because of their remarkable circles around the eyes they are known as “eyes of the fancy”. They are so small that you can easily within one’s hand. Moreover, the Dward Hoto is very playful and active and each one has a different personality. The name of the American Fuzzy Lop is derived from the fact that the ears of this rabbit lop along the side of their face. Similar to other dwarf breeds this breed can be seen as playful rabbits. They love getting attention from their owners as well as from other rabbits. Moreover, the American Fuzzy Lop has a muscular body. The Jersey Wooly breed was accepted in 1998 by the ARBA and is a crossing of the Netherland dwarf and the Angora. They are seen as very docile rabbits and therefore they will easily learn to obey to and interact with their owners.